One of the most popular National Parks in the United States is Zion National Park. Even though Yellowstone and Glacier hold our hearts, we may have just left another piece of them at Zion. 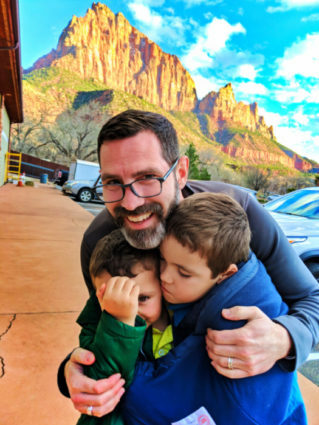 Planning for and visiting Zion National Park with kids is really wonderful. There are boundless options for hiking and relaxing, and getting around the park is an adventure in itself. 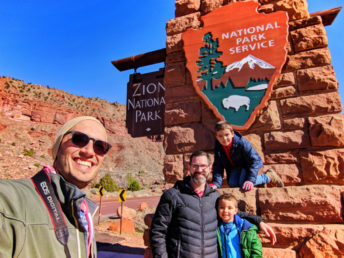 Here’s how you can make visiting Zion National Park easy and stress free… cuz that’s most important when there’s nature to be a part of. 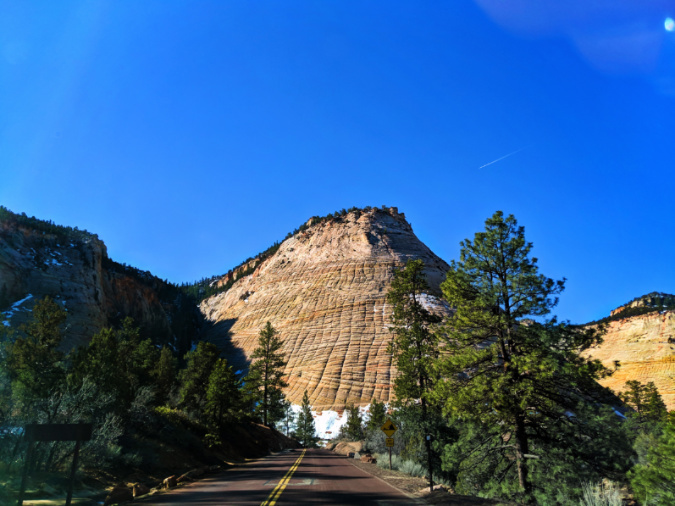 This is our guide to planning a Zion National Park visit. 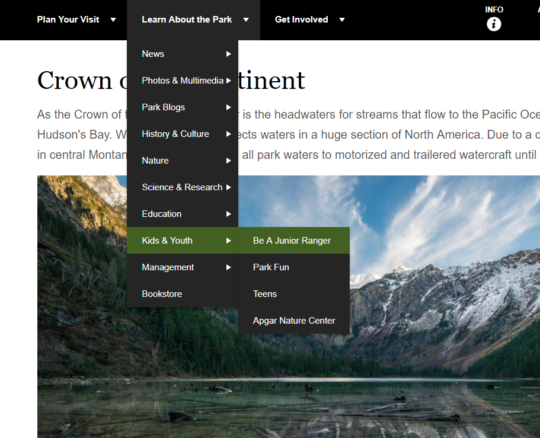 Below you’ll find tips for navigating the park experience, great ways to help kids (and adults) learn with National Park programs, and tips for transportation all around. If you have questions we don’t answer, leave us a comment or send us a note! 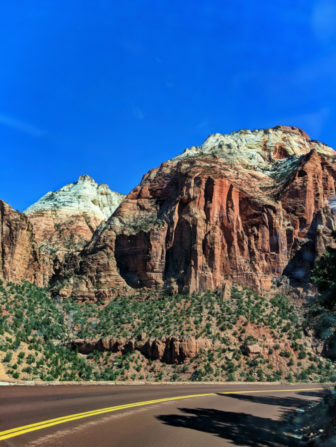 Note: this is just the first of our four part series on visiting Zion National Park. We’ll update and add links as the next sections are completed. Feel free to review our Travel Journal for additional information regarding lodging and hikes in Zion. As adults, when we visit National Parks we stop into the ranger station or Visitor Center and pick our hikes and go. When you visit with kids there is more to consider, including educational opportunities and things you had no idea would be fascinating to them. 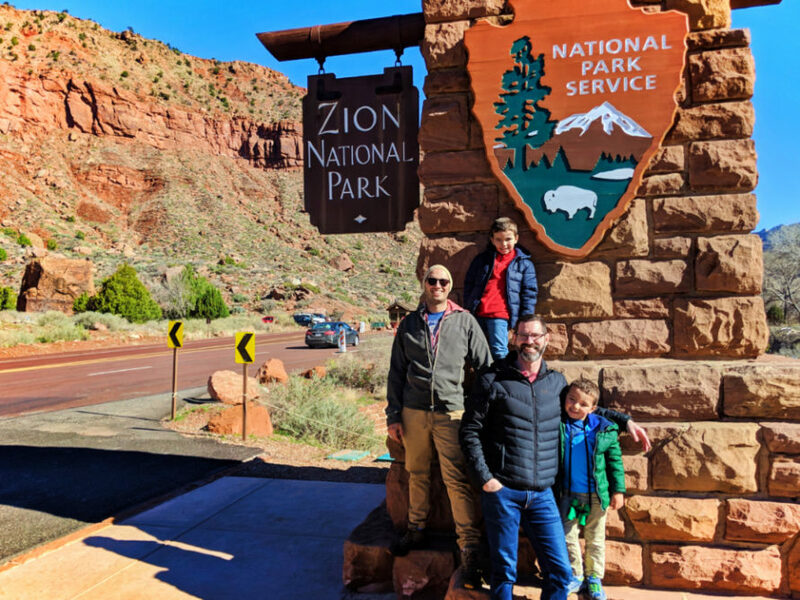 Even though Zion might not be on a kid’s bucket list, they will want to enjoy themselves just as much as the adults do. 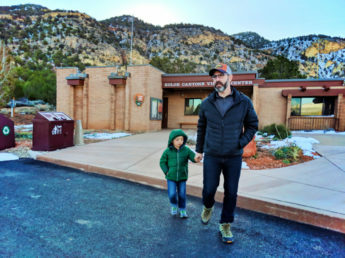 The first stop you need to make what you visit Zion National Park with kids is the Visitor Center. Located just inside the main entrance from Springdale, UT, it’s the one stop shop for trail information, ranger-led programs, and Zion NPS gear. This is always where you can register for more intense trails and canyoning and get your back country permits. The main Visitors Center is mostly a stop for info and swag. 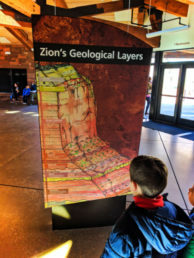 For the traditional Visitor Center history and science information, you actually need to swing into the Zion Human History Museum. Here you’ll learn about early inhabitants of the park, how people have interacted with the land and nature, and there are more rangers available for conversation and to answer many of the non-technical questions. 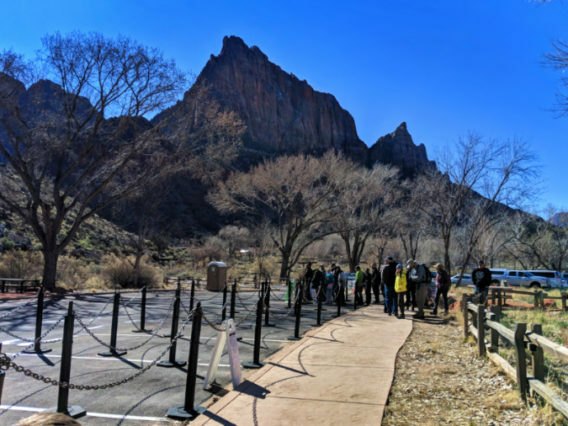 It’s a great place to visit if you’re doing Zion with kids so they can gain some understanding and connection with the area. Tip: if you are planning to stop at the Zion Human History Museum, plan it into your day, as it closes earlier than the rest of the park. Hit it up to start your day if the timing is right. There is also a Visitor Center at the Kolob Canyons entrance. This is rather off-the-beaten-path, but a good stop for current information about the northwestern corner of the park, including hiking and ranger programs. 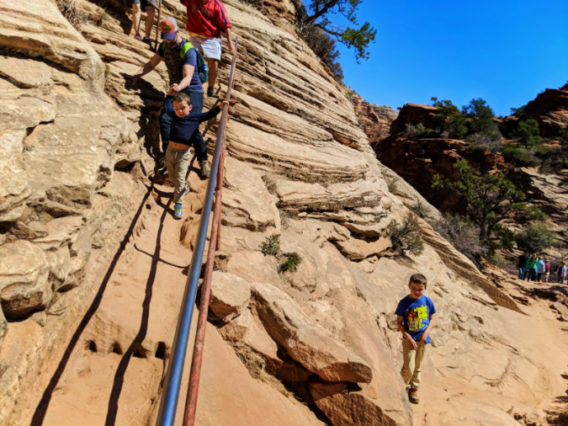 Zion National Park with kids is really fun and a great learning experience, so use the awesome ranger staff to enhance your visit and gain some new knowledge and experiences. 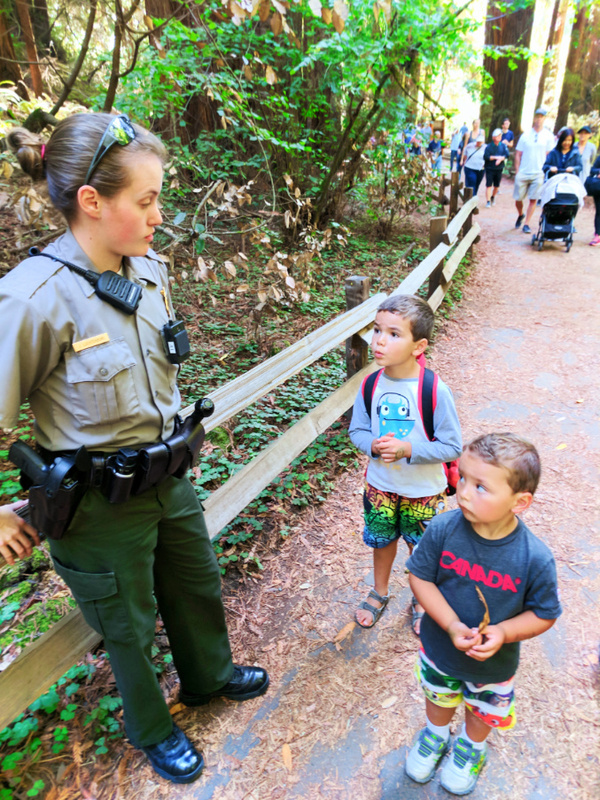 We love participating in Junior Ranger Programs. And don’t let the name fool you: Junior Ranger workbooks and activities are for all ages visiting National Parks. 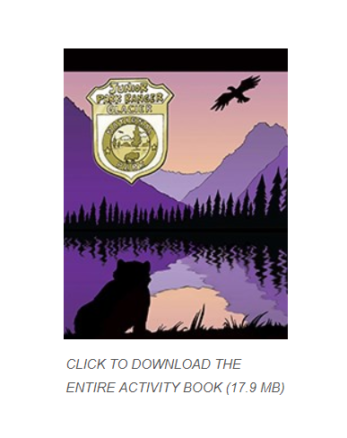 What is the Junior Ranger Program? 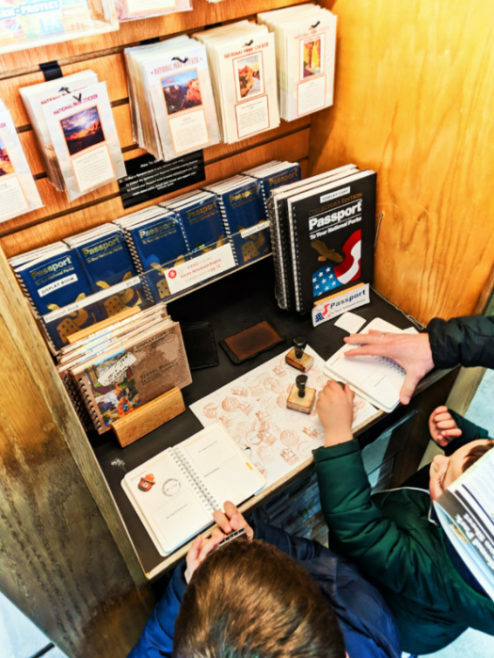 Stop by a ranger station or Visitor Center and get a workbook on your next National Park visit. It’s full of activities for different ages that teach about the many aspects of the prospective park. 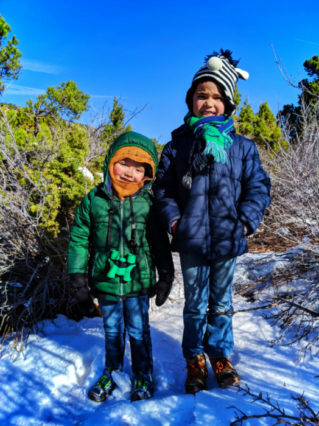 To earn a Junior Ranger badge for each park, you need to complete the required activities per age, which may include participating in a ranger talk/walk, doing a scavenger hunt, completing scientific fill in the blanks, or even drawing a habitat. Each Park’s program varies. There’s even a Cave Ranger program for Pinnacles NPS, Oregon Caves and others. Tip: we have used the Junior Ranger Program packets in homeschooling, both from printing them online and from collecting them on-site. They act as a great prompt for lesson plans and supplementing writing and science curriculum. 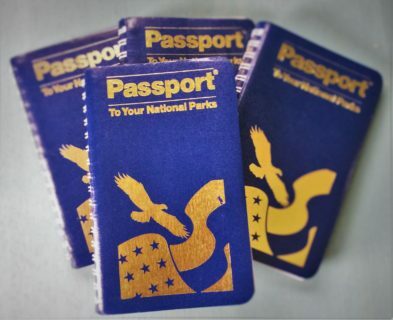 Don’t forget your National Parks Passport! We sometimes do forget to bring them on our trips, but that’s okay. 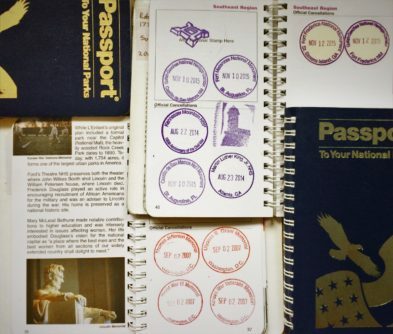 The Passport program is a way to document your visits to the many National Park Service sites, including National Monuments, Wild and Scenic Rivers and more. The kids love getting the dated cancellations and local stamps, and we love that it gives them something to look forward to, however small. We have done National Park Passports for ourselves and the kids since the get-go, so have a nice collection of stamps, preserving our memories. We always like to take a moment to remind travelers of how to be prepared in National Parks. It’s not just about bringing your reusable water bottle, but about safety and fun! Just like with any trip up into the mountains, you need to be prepared for all weather. True, if you’re visiting in the high season of summer you’ll most likely have hot days and cool nights, so packing is pretty easy. 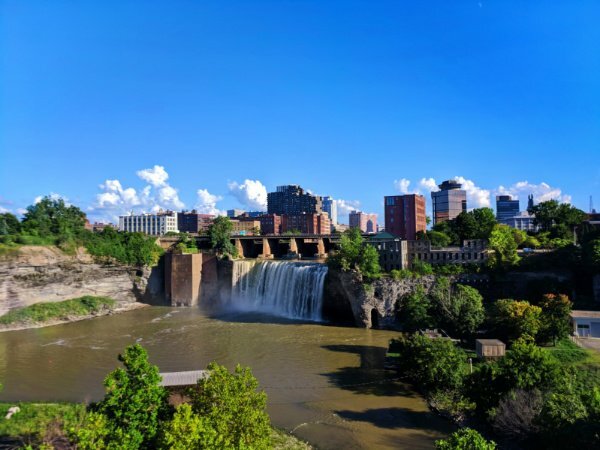 If you’re visiting Fall through Spring, you need to plan a bit more. Being located at 3000 feet, which isn’t too high, you’d think there’s not a lot to worry about with weather in Zion. It’s actually a place that’s known for bizarre rainstorms, flash flooding and out of season snow. When you’re packing for Zion, go with what the weather report says, but also pack for at least one day of the worst weather possible. Tip: we always pack gloves and hats when we head to the mountains or high desert due to the swing in temperatures from morning to evening. Be prepared for temps in the teens or 80s. Check out our guide for Yellowstone packing. 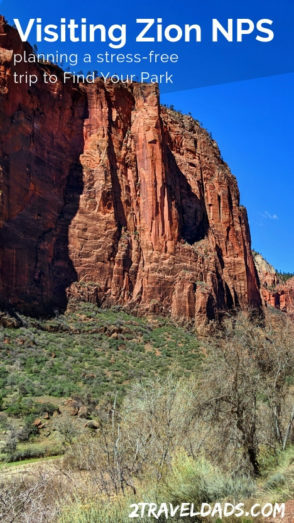 Other key things to pack for Zion National Park are binoculars for bird watching, camera equipment (cuz you’ll want to take photos), a good backpack for hiking, and a reusable water bottle for each person. There is no bottled water sold within Zion National Park, so bring your own bottle or buy one there. There are plenty of Zion spring water fountains available to fill up at trail heads and the Visitor Center. Being prepared to be safe isn’t rocket science, but it’s easy to get carried away or excited. 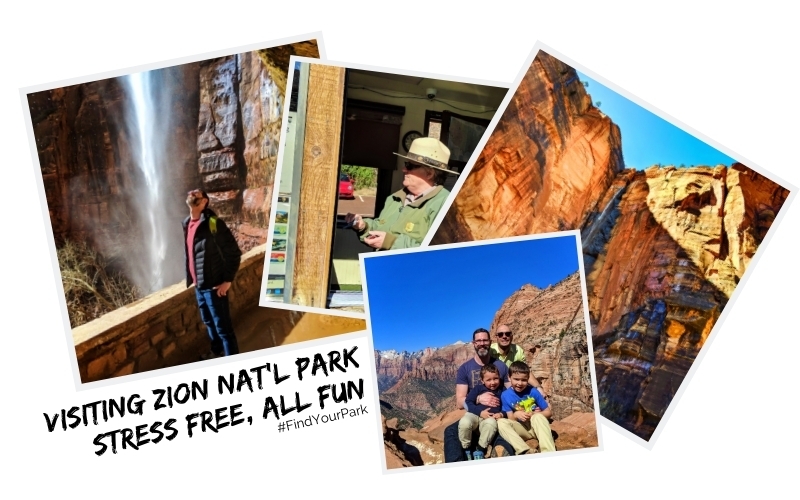 Manage yourself, do a little packing and planning, and you’ll be set up for success and have a great time visiting Zion National Park. Due to the popularity and need to protect Zion NPS, there is a tram/shuttle system in place within the park. Not all areas of Zion are tram-only, but the main valley is not accessible by car in Spring, Summer and Fall. In late Fall through mid-winter, you can drive all through the park, assuming that roads are plowed and open. There are limited parking spots in the shuttle stop areas, but you should only be parking in designated zones. 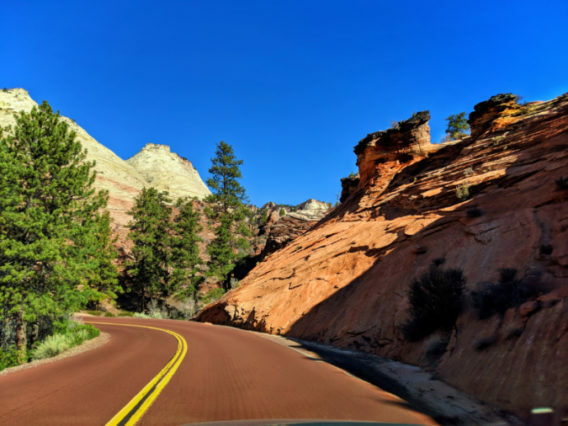 If there isn’t parking where you want to stop, don’t worry: half the fun of being in Zion is just walking the canyon floor and being amazing by your surroundings. As I said, in high season the main Zion Canyon is accessible only via shuttle bus, but there are other parts of the Park that you can still drive to. 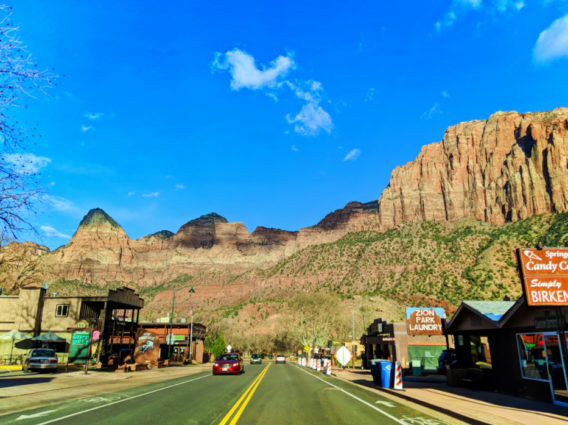 The main entrance from Springdale, Utah is where you’ll enter to access the primary Visitor Center and the Zion Human History Museum. You’ll also enter here to drive the Zion-Mt Carmel Highway eastbound. This is open to vehicular traffic nearly all year, only closing for weather and poor road conditions. Note: due to the impromptu storms that hit Zion National Park, flash flooding and overflowing streams are common. With that, there are times the Zion-Mt Carmel Highway gets damaged. That happened in early 2019 causing the road to close temporarily and then running at only one lane following. One of the coolest things about driving in Zion National Park is accessing the eastern side of the Park. 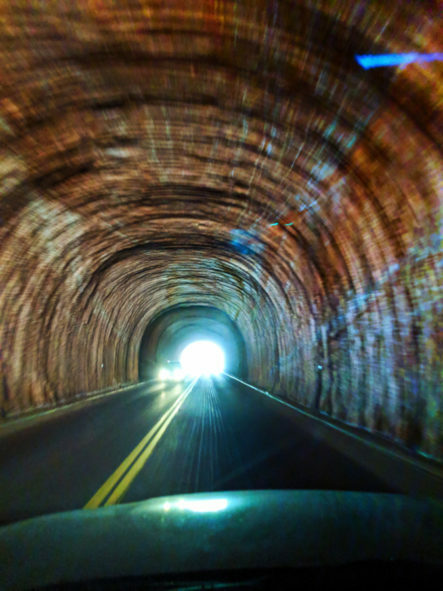 You do this from the main area by driving through a series of tunnels, including a 1.1 mile tunnel through the canyon walls. If you’re easily distracted, you should let somebody else do the driving because you’re driving on steep cliffs with oncoming traffic, but if you can manage yourself and take advantage of scenic pullouts, it’s one of the most spectacular drives in America’s National Parks. The Kolob Canyons area of Zion NPS is also open to vehicle traffic year-round, weather condition dependent. This remote part of the Park is gorgeous and the views of this whole other set of canyons are breathtaking. The drive is not too intense, but still you need to exercise caution as you ascend to the premium viewpoint of the area. Note: Driving in winter conditions, be aware of frozen waterfalls and their related ice sheets that may streak the roads. 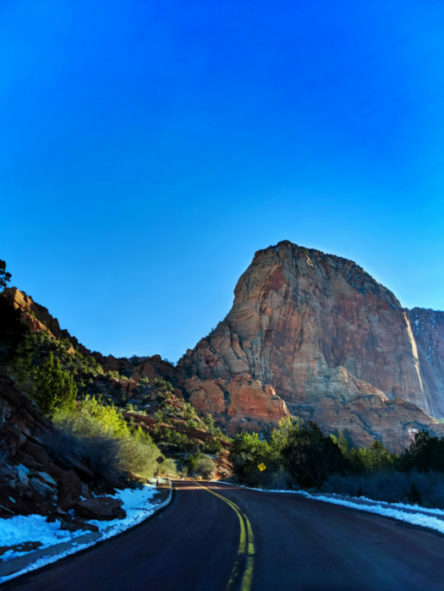 On any of the gorgeous drives in Zion National Park, you’ll want to enjoy the scenery, as it’s unlike any other. Because the roads are so windy and a bit on the dangerous side, you’ll want to be sure only to park in designated pull out areas. This goes for stopping to take pictures AND for parking when you head out on a hike. There are ample parking areas, but you may have to walk a ways to your trail head or view point from your car. SAFETY FIRST. When you’re parking, be sure to be as far off the road as you can safely be. 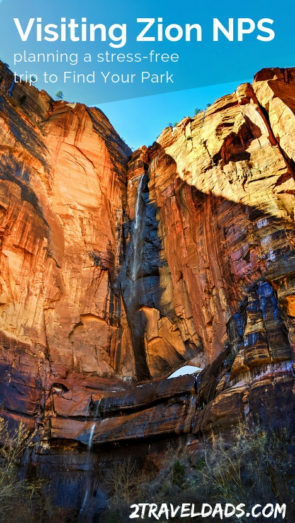 This is the key; these are the best tips for visiting Zion National Park with the least stress and most fun. USE THE ZION SHUTTLE. 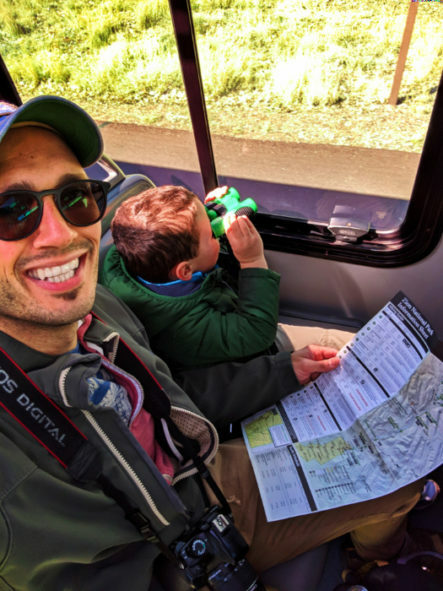 Seriously, if you’re visiting the Park when the shuttle is running, which is most of the year, you should plan to ride it to any stop within the main canyon. You can’t drive to those spots in high season anyway, so use the shuttle. I know, it seems like it’s your only option in the most popular area of Zion National Park, and for the most part it is. 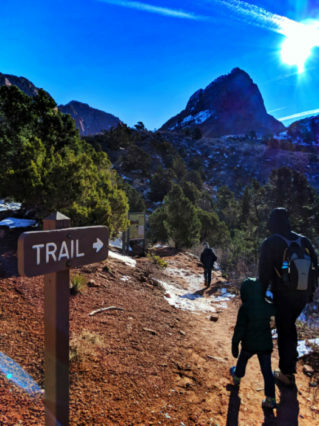 You can also hike along the Virgin River to most of your key areas, but that takes a long time and will wear you out before you get to most of the hiking spots. 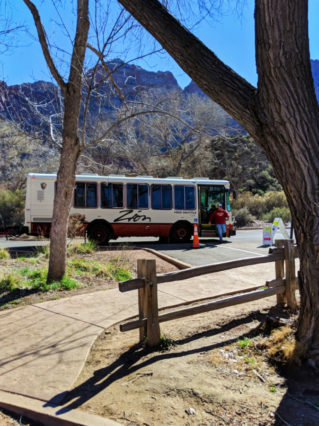 Tip: enjoy the free Zion Shuttle, as other National Parks have shuttles or tours, but not all are free. 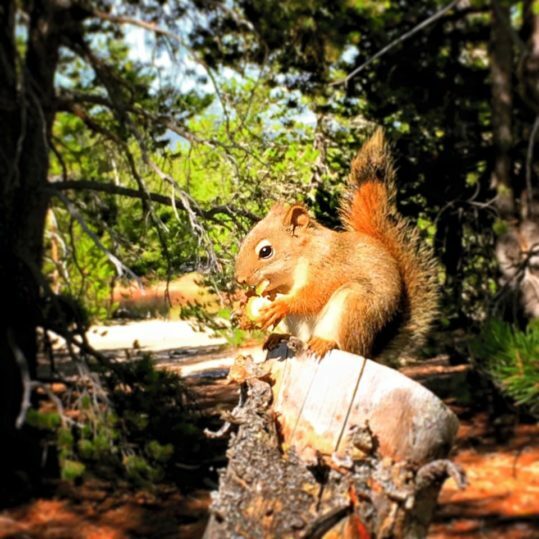 Check out our Yosemite Valley Tour to see what’s offered in other National Parks. Shuttle hours: First bus leaves from Visitors Center at 7:00 am; Last bus leaves from the end of the canyon at 6:44 pm. DO NOT MISS THAT LAST BUS. 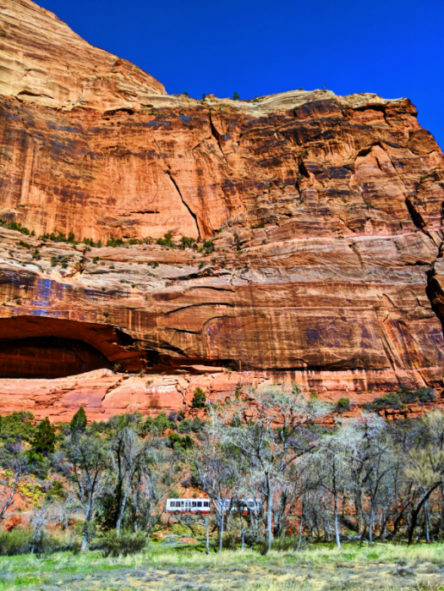 Nope, entry fees into Zion National Park is still the same when you enter via the shuttle. Whether you’ve driven in or caught the shuttle from town you are required to pay for entry or show a valid pass. When you arrive via the Springdale shuttle, you’re dropped off just outside the park gate where you’ll then go through a walk-though ticket station. Once on the other side you’ll join the other paying guests who’ve driven and you’re free to hike or jump on the shuttle to go to the end of the canyon. Like with any form of public transportation, you need to be mindful that you’re on a moving vehicle. Just like you’d give up your seat on a subway or regular bus, the same courtesy needs to be extended to those in need on the Zion Shuttle. 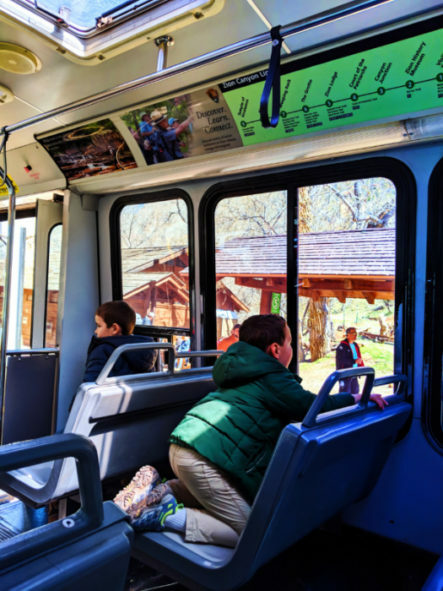 Experienced, fit hikers aren’t the only ones visiting the park, so for the safety of those who can’t well stand on a moving bus give up your seat. Food and drink isn’t allowed on the Zion Shuttle. You can indeed bring it on (like for a picnic) but you cannot consume it on the buses. Drinking water is fine and encouraged, but nothing else. The shuttle stops are closer than you expect, so you can wait two minutes to have your snack. 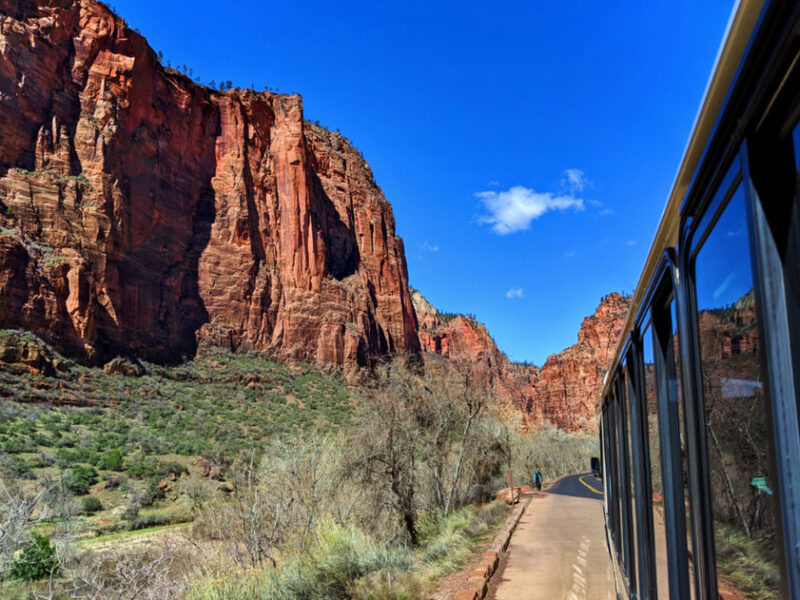 Enjoy the view from the Zion Shuttle. The ride to the end of Zion Canyon is about 40 minutes, so open your window and take in the scenery. There will be times the shuttle stops but you don’t get out, so use those moments to snap some beautiful shots from the bus. Tip: check out our guide to taking awesome travel photos, including family shots and sweeping landscape views. Plan your hiking/stops in advance. 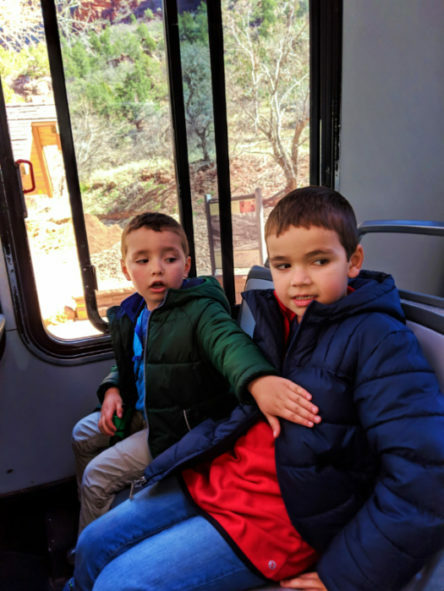 You can see from the shuttle how busy most trails and viewpoints are, but if you know if you want to stop and it’s already busy, if you’ve planned you can happily continue onto your next designated stop. Listen up, because things are getting serious. Parking at Zion National Park is not complicated, but it’s crowded. 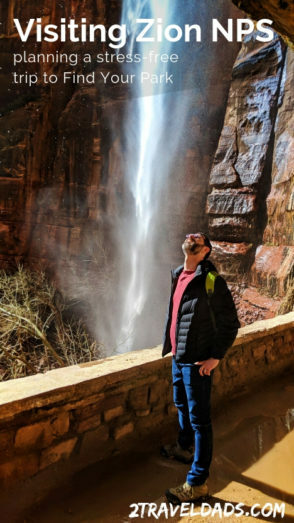 These tips will make visiting Zion National Park much easier and save you time when you actually arrive. You don’t want to stress about parking a car when you could be hiking or relaxing in this unique location. Remember, the shuttle is your friend, so use it when/where it’s available. 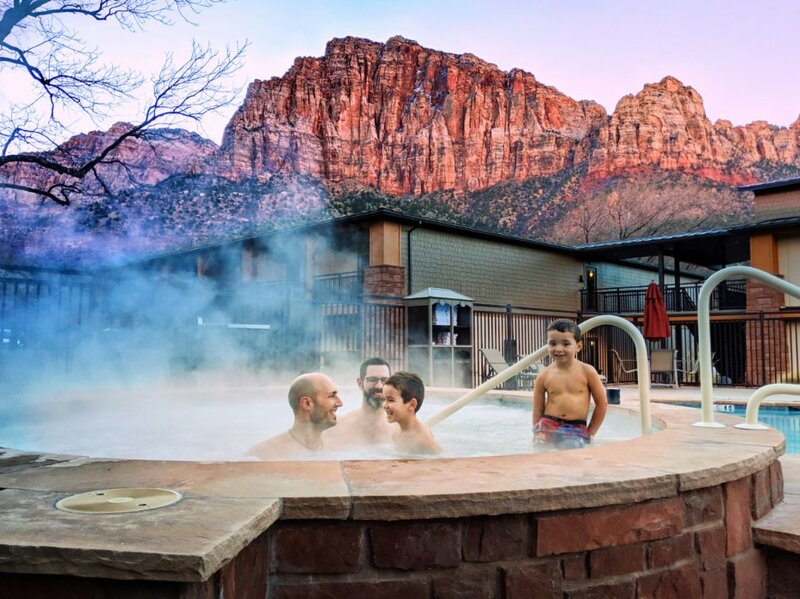 Staying right outside Zion National Park is really easy, and with the influx of hotel brands it’s become more affordable, particularly in the off-season. Most hotels have a stop for the Springdale Shuttle which takes you to the main entrance to the park. If your hotel doesn’t have its own stop, there is probably one within a few hundred feet of your lodging’s entrance. PARK AT YOUR HOTEL. You have a parking spot already and if you’re planning on just exploring the main part of the Zion Canyon, you won’t be driving yourself anyways. If you are staying outside of Springdale and driving in, you can park just outside the National Park entrance at the visitors information center. There is ample parking here and other lots around town, so you’ll be able to leave your vehicle and catch the free shuttle to the Park. Tip: Spring through Fall the weather can get HOT. Be sure you’ve not left anything meltable in your car and that you’ve secured your belonging properly. You don’t want to come back to damaged or missing goods. Once you’re inside Zion NPS, the parking at the Visitor Center is very limited. They are working hard to manage the growing need for parking and crowd control, but there are still limits to where you can park. If you must park your car within the entrance, arrive very early in the day and catch one of the first shuttles (7:00 am is first shuttle). If you arrive late morning you could be diverted back to a parking area in town, so be early or just park outside the National Park. 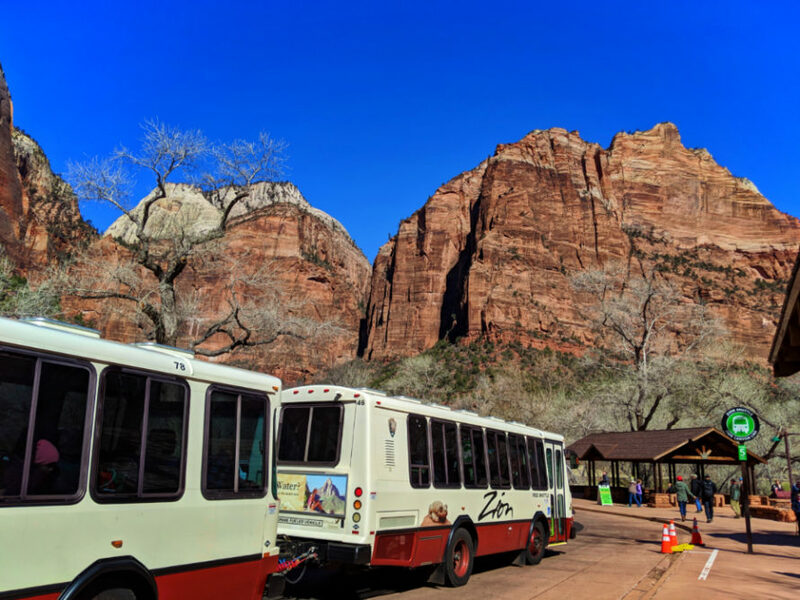 Note: the Zion Shuttle does come every 7 to 10 minutes throughout the day, so the queue does move along nicely, but during high season at the start of the hiking day, it can be quite the wait. Wow! I know this was a lot of information, but planning appropriately and being prepared is the best way to visit Zion National Park. 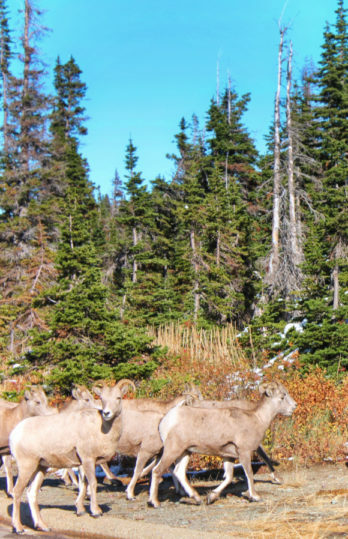 The time you save by planning and researching has big payoffs when it’s time for the actual National Park experience. Enjoy Zion! Take lots of pictures! Tell us if you have any additional tips for planning your Zion visit by leaving a comment or sending us a note. 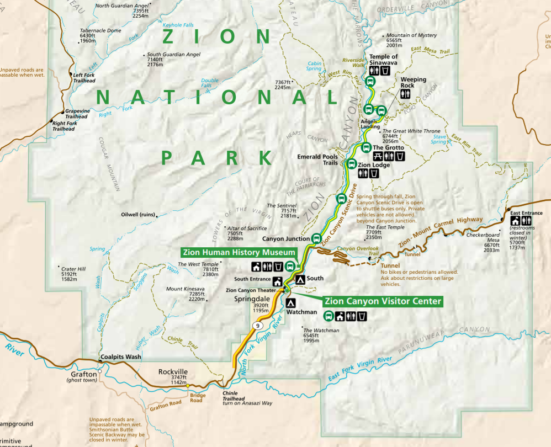 Want to pin this for planning your own Zion National Park visit? Go for it!! !